A large brick built garage with tin roof and roll-up metal door, just off the main thoroughfare in West Kilbride, serves as the workshop. An extra large wicker basket perched on the roof a rustic beacon to those in search of the local basketmaker. The building had earlier been a small motor repair garage, hence the wide roll-up door. With the door rolled-up we resemble something more like a shop in an Indian village, with goods meeting pavement, rather than a retail space in a small town on the West Coast of Scotland. 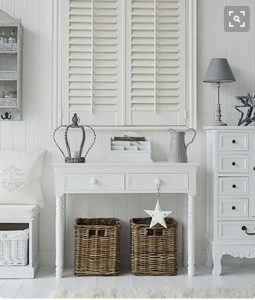 Open to the elements like that, it would naturally be very cold – even for the hardiest of Scottish craftsmen or women – especially in winter, and, without heating, drying baskets would also be a problem. To remedy this, we had a little bothy built inside the workshop – well insulated and heated – just sufficient space for making and drying. The roof itself has several ‘windows’ which, for most of the year, allow in sufficient natural light and save the expense of artificial lighting. Outside of the bothy, the rest of the workshop is divided into four sections. By the open front there’s a display area where homeless baskets of all shapes and sizes wait patiently to be re-housed. There’s not much by way of passing trade as we’re slightly out of town, but, we do get some visitor calling in to buy or order something. West Kilbride is a tourist destination of sorts, being Scotland’s designated Craft Town. There are several makers in the town working out of retail-units-turned-studios under the umbrella of the Craft Town Initiative. It’s all part of a regeneration programme that started around the turn of the century and has transformed the town. Even so, there are insufficient numbers of visitors to provide a maker with a steady supply of customers, so we all need other outlets for our products, or second jobs. Many of the makers in the town hold down part-time jobs to support themselves. Back to the workshop and behind the display area there’s the bothy on the right and a second workspace opposite this. Behind the second workspace sits a purpose built shelving ‘unit’ for storing willow bundles with a section for the cardboard we use for packaging. A couple of nearby independent retail businesses drop their cardboard boxes off to us instead of sending it for recycling. We like the idea of the village working together like this, helping each other out and in the process making a lesser impact on the environment. The soaking tank sits along the wall just in front of the bothy. Buff willow for the next day’s baskets, is put to soak mid-afternoon, then removed, wrapped in Hessian and left to mellow overnight. Brown or steamed willow has to be prepared several days in advance, of course, so a certain amount of planning has to go into the weekly routine, as generally Virgil is working to a list, prepared by me, of the orders for the coming week. The day starts around 9am and finishes late, maybe 6 or 6.30pm, Monday to Saturday. Often the first job of the day is packing baskets being despatched that day. It’s easier with two people, because we are using cardboard to fold around the baskets then holding it all together with pallet wrap – one of us is required to hold and manoeuvre the parcel (Virgil) and one to operate the pallet wrapping (me). The workshop is just a couple of minutes’ walk from home so I can easily come in as and when needed. We have a carrier who comes to collect the larger parcels. Smaller ones require a trip to the local Post Office – another job for me. The second workspace is more unused than used, but it’s there should we get really busy and need a bit of help or if we have a student. We can’t run classes in the workshop – it’s too small, but for a single student it works fine and it’s nice for a solitary maker to have company from time-to-time. I work from home dealing with the enquiries, quotations, customer service and doing all the accounts, admin and marketing. I probably spend a good 4 hours a day in this supportive role, the hardest of which is the marketing, espcially the social media marketing which we we’ve been told is absolutely crutial these days if you want anyone younger than 35 to find you. I’m not a natural at it, so it’s a big effort for me. Neither of us come from Scotland, nor do we have any connections with Scotland. Coming here was almost like sticking a pin in a map of the UK and seeing where it landed. We were living in Essex at the time, but wanted to move away, further north. We spotted an article in the Basketmakers’ Association newsletter about Craft Town Scotland and the project to regenerate the town. They were inviting makers to exhibit at the new gallery but mentioned also offering studios to makers at nominal rents. We came, we saw and decided to stay. After about 6 years renting a studio in the town we had the chance to buy the garage building and the rest, as they say, is history. You can spend years together searching for the perfect basket to fit a particular space in your home, and maybe end up with something that will do. Baskets are wonderful items, made of natural materials, which bring a softness, a rustic calmness to the room, as well as being super practical and a beautiful way to store your everyday things. The beauty of having them made for you is that you get baskets that fit perfectly and you can choose the willow colour, style of weave and border and what kind of handles you have. Here’s an example of a situation crying out for bespoke baskets. The baskets are much too small for the space. The height is about right, but they could be several inches wider, so look a bit lost there. By contrast, here are some bespoke baskets in a similar situation. The baskets were made to fit the space. 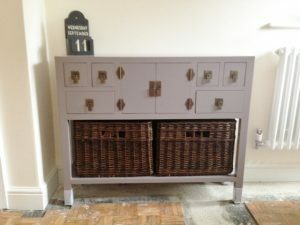 The willow colour, weave and border chosen to suit the cabinet. To get started creating your perfect custom made baskets, first take a look at the custom made basket options page. There are many photographs of baskets in-situ on the gallery page also, which might offer some inspiration. We’re here also to help with any enquiries you may have. Feel free to call Alison on 01294 829012 or send an email. It’s funny. I’ve often noticed how interesting it is when I meet someone and ask… ‘what do you do?’ and I’m introduced to a whole new world I knew nothing about. I was at a friends house one time, they are farmers, and I picked up a magazine from the table ‘Farmer’s Weekly’, or something similar. I had a quick flip through the pages and found myself in another world – prices of lambs, tractor reviews, advice on diseases, pests and weeds, and so on. I realised how little we know of occupations other than our own. 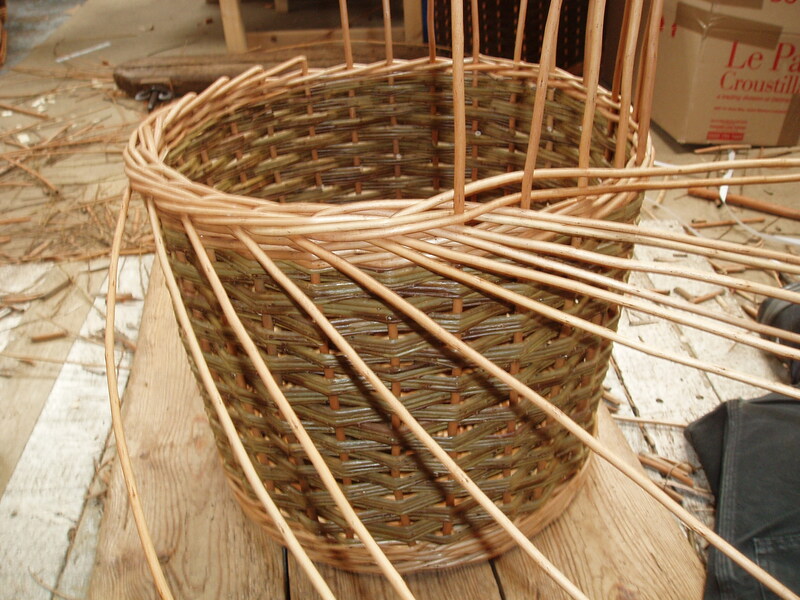 I wonder then… how much of the life of a basket maker would be generally known, and would it surprise anyone? The ancient craft of basket making has remained pretty much unchanged throughout it’s existence. There was a breakthrough in the 19th century when someone worked out that if you boil willow for 10 hours you can strip the bark easily and, not only that, but you get a new colour, ‘buff’. Prior to this most baskets were made from un-stripped willow. Some willow would be stripped by hand in the spring time after the sap has risen and when the bark was fresh and soft, to reveal the beautiful natural white colour of the inner wood. Because the stripping had to be done when the willow was freshly cut in the spring there was a limit to how much could be produced, and, of course, it was time consuming to strip each rod of willow by hand using a small hand tool, a stripping brake, so it was kept for special baskets, cribs and washing baskets mostly. The other great revolution around this time was the manufacture of ‘stripping machines’ which enabled production to be increased to meet the ever growing demands for wicker baskets. Buff willow was a great material because it’s much stronger and more durable than un-stripped willow, easier to work with, quicker to soak and it could be made all year round. It went on to be used in many industries, and for the military, throughout the world as well as in homes of course. That was the time before plastics, when many thousands of people worked in the basket making industry. In willow growing regions of the UK, whole villages were involved in the industry. The children were even given holidays from school to help with the harvest and stripping of the willow. Growing, harvesting and basket making all part of everyday life. But, for every new thing there is the demise of some old ones and the advent of plastics all but decimated the vibrant basket making industry in the UK. There are many basket makers around the world making willow coffins. Mostly they make their caskets to supply a wholesaler who then supplies the funeral directors acting on behalf of a client, so they have no real contact with the person who will be occupying their basket. That client may even be in a far away country. It’s just a job a means to earn a living. However, being a general basket maker who also makes willow caskets it’s quite a different experience. We are usually approached, not by the funeral director or wholesaler, but directly by the relatives of the deceased, or soon to be deceased, or, occasionally, by the person for whom the coffin is intended ahead of their departure from the world. Sometimes we are asked to make a coffin for someone we know, a friend or relative. It’s a very personal thing, we are much closer to the user than most coffin makers are. It’s a very special thing to be making the casket especially for a particular person and for those ordering the making, when they receive it, they have the connection with the people who made it, and can feel the care and attention that has gone into it. We usually receive communication, a letter or beautiful card, from the relatives after the funeral with their words of thanks and appreciation and expressing how beautiful the ceremony was, made special by our work. The link comes full circle. I found quite a few uses of the work basket in various sayings or idioms. Interestingly, at first glance, they mostly have a negative connotation. If you were reduced to poverty you would be ‘brought to the basket’. In the North Country being described as ‘a pin’ implied you were somewhat miserly. Although this came from the phrase ‘To pin the basket’ which meant to conclude the matter. 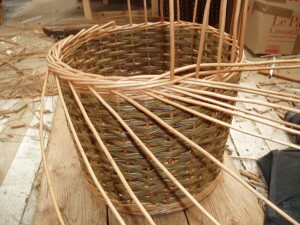 The pin being the small piece of willow used for fastening the lid of the basket. So probably the derisory term came from the pin being very small in some way. Being ‘left in the basket’ was used to say that one had been left in the lurch. Worse still the phrase ‘going to the basket’ meant ‘going to prison. The term ‘Basket Justices’ was applied to justices who allowed themselves to be bought by gifts of baskets full of game. ‘A chatter-basket’ An incessant talker. A basket case – A nervous wreck. It’s a bit surprising to see so many negative uses of the word basket, but on reflection, thinking back to the times when these terms were used, and how prolific baskets were at that time, I think it really shows that baskets were such a fundamental part of life. The basket was the most basic thing that every household had no matter what it’s status. So being left in the basket, put into the basket, brought to the basket, going to the basket. Everyone could relate to the ‘basket’ element – it was a basic requirement of life. There are so many things that are not needed for making baskets. Electricity, for one…. without it the world as we know it would descend into chaos. Everything collapsing in the blink of an eye. Industry without power is finished. The world of finance? Would all the money be lost without access to it? All the billions of zeros… gone. Entertainment as we know it, finished, except for live and unplugged music and theatre. (hmmm…maybe that’s not so bad). But what about the basket maker? What about him? He is just fine. He sits there in his shed, workshop or garden, and makes his baskets. Maybe he would miss a Test Match Special on the radio… (yes, that he would miss). His working day would be shorter in the winter of course, but that’s fine, he can always catch up in summer when the days are longer.